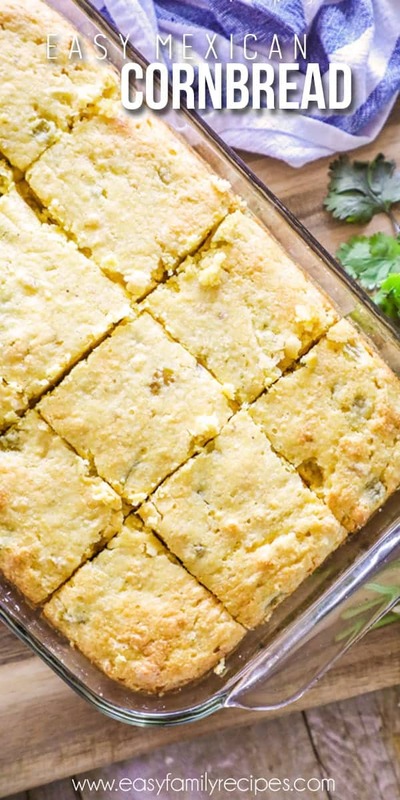 This Easy Mexican Cornbread is soft, thick and mouthwateringly delicious! It uses green chiles to perfectly compliment the sweetness of the corn and add a little Mexican flavor without being overwhelming. It is absolutely perfect to go with a big bowl of chili or as side dish to barbecue! Cornbread is just one of those things that when it is just okay it is easy to pass on, but when it is really, really good, it is pretty much irresistible to me. Let me just cut to the chase. This one is irresistible. This corn bread isn’t dry or overly crumbly, but instead is so moist, tender and soft. The recipe is a bit different in that it doesn’t use liquid. 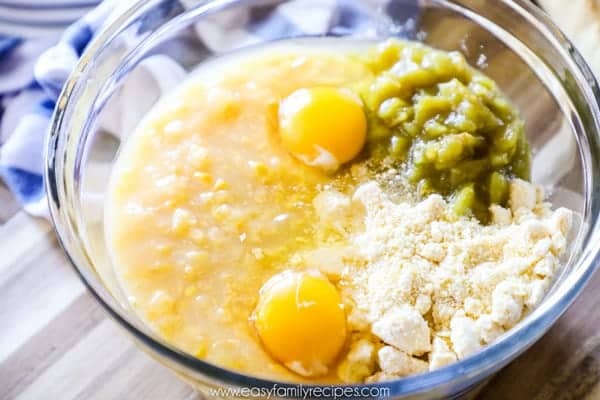 There is no oil or water, just 4 (or 5) simple ingredients: Jiffy Cornbread mix, creamed corn, eggs, and green chilis. Jalapeños are an an optional addition if you want it to have a little kick, but I usually make it without since my kids love it with just the green chiles. 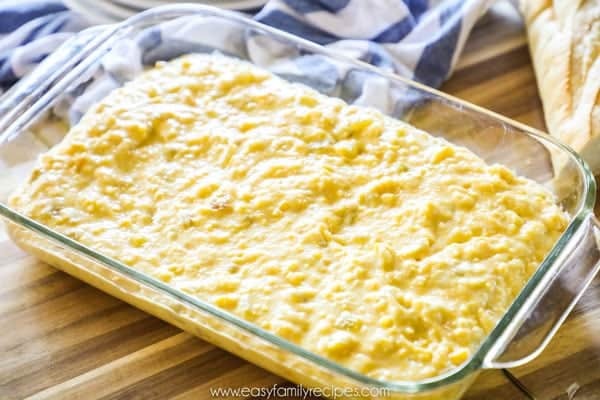 The creamed corn and eggs pull double duty binding the bread together and giving it the super soft and moist texture. The Jiffy is a must. I have made this recipe countless times over the years and tried to substitute another brand when it was on sale at the store but it was NOT the same. It is honestly more on the rare side for me to be super brand loyal but this is one that you can’t substitute well with another so if you want it to come out GREAT stick to Jiffy! What Can I Bake Mexican Cornbread in? My personal favorites are the 11×7 (I use the 2 qt pyrex) and the 12 muffins (or sometimes I do a pan of mini muffins because my kids love it!) I will detail out the cooking time for each in the recipe below. 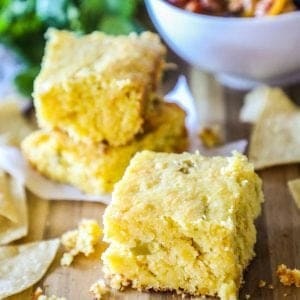 How to serve Easy Mexican Cornbread? This recipe can be made and either served right from the muffin tin or sliced up in as big or small of slices as you like. 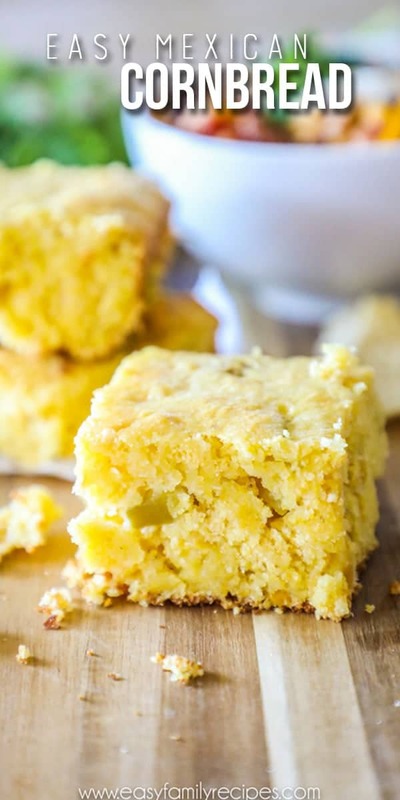 I love butter so I have to slice mine in half and add some to melt right in, but this cornbread is so moist and has so much flavor that you don’t have to use butter if you want to keep it a bit lighter. A fun tip is that if you use a plastic knife to slice the Easy Mexican Cornbread, then it won’t stick nearly as much and cuts much more cleanly while warm. 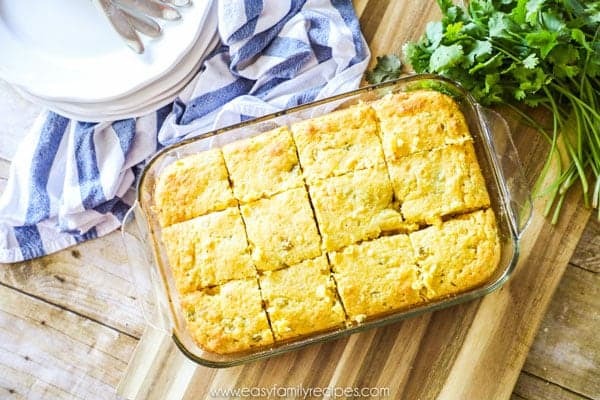 If you have a favorite way to serve it, or meal to serve this easy mexican cornbread with, I would love to hear it! Leave me a note in the comments so I can try it out too! This recipe couldn’t be easier with only 4-5 ingredients. It is pretty fool-proof and since everything is mixed in one bowl, it makes for super easy clean up as a bonus. I am going to walk though the recipe here step by step and go over my tips and tricks for making it. If you just want the quick version, feel free to scroll down to the recipe card at the bottom of this post. 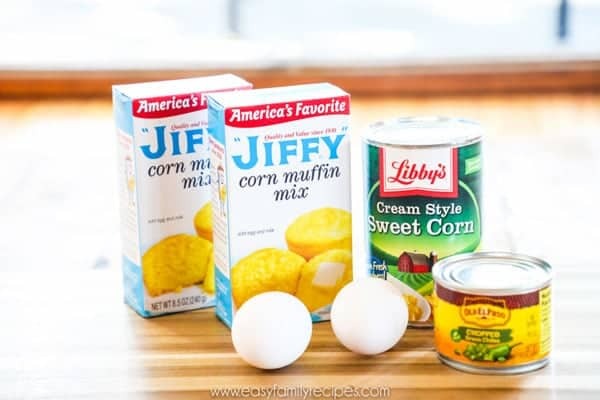 2 boxes Jiffy Corn Muffin Mix– It HAS to be Jiffy! You won’t get the same results with other brands. 1 can mild chopped green chiles – Use the 4.5 oz size can. I prefer Old El Paso chopped green chiles because they are a bit more crushed so they really incorporate the flavor well. 1/4 cup chopped jarred jalapeños (optional)- To prep these, drain the jalapeño slices and then chop them. If you chop them more finely it will distribute the flavor a bit more,or if you leave them larger you will get spicier bites. 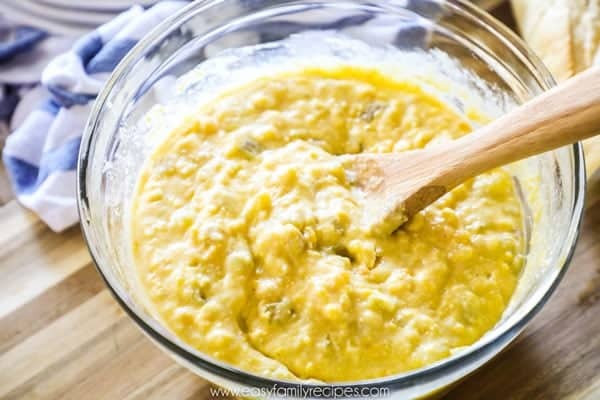 In a large bowl, mix all ingredients together until everything is combined and just moistened. Make sure that everything is mixed in and there are no dry spots, but it will turn out more tender if you don’t over mix. Spread in the dish of your choice and bake according to the directions for your choice below. You can use metal or glass to bake in and your choice of square, round, rectangle or muffin sized. I also sometimes make them in mini muffins for my kids, but it makes like a billion mini muffins so I usually do one tray in my mini muffin pan then use the remaining mixture to make six or so regular muffins. Cornbread should be cooked until the center is set and a toothpick comes out clean. It is hard to give an exact cooking time because each oven and climate cook differently so you may need to watch it a bit the first time you make this for it to come out perfectly, but it will be worth it! I like to watch the center. If it is shiny it probably isn’t ready yet. Once you think it is done, use a toothpick. Insert it into the center and if it comes out clean or with just a couple of individual crumbs it is done! With those tips in mind you can use this guideline for how long to cook the cornbread based on what type of dish you bake it in. I really hope that you enjoy this as much as we do! It is such an easy side and the best part is the whole family gets excited to see it and cleans their plates for it. If you get a chance to make it, I would love it if you would take a moment to leave me a note. It just makes my day to know people are making my recipes. Or snap a photo and tag me on Instagram @easyfamilyrecipes so I can see what you are cooking! 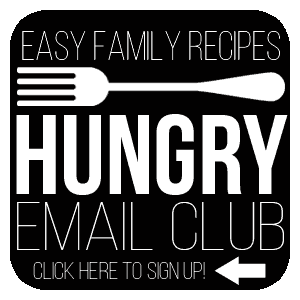 And before you go… don’t forget to sign up for my Hungry Email Club for more easy recipes and dinner inspiration! This Easy Mexican Cornbread recipe is soft, tender, and delicious! With only a few ingredients, it is as easy to make as it is delicious. You can make it with just green chiles for a mild Mexican Cornbread or add the jalapeños for a spicer version. In a large bowl, mix all ingredients together until everything is combined and just moistened. Spread in the dish of your choice and bake according to the directions for your choice below. Cornbread should be cooked until the center is set and a toothpick comes out clean. Leftover Easy Mexican Cornbread can be stored in an airtight container in the refrigerator for up to 3 days or in the freezer for up to 1 month. How long do you bake the mini muffins?